Franz Fühmann’s biography reflects the upheavals and contradictions of the 20th century like no other. Fühmann was born on January 15, 1922 in Rochlitz an der Iser in the Sudetenland region of Czechoslovakia (now Rokytnice nad Jizerou in the Czech Republic) as the son of a pharmacist. In 1932 he was enrolled in the Jesuit boarding school of Kalksburg near Vienna, with further schooling in Reichenberg (now Liberec) and Hohenelbe (now Vrchlabí). He became a member of the Sudeten-fascist Deutscher Turnverein (German Gymnastics Association) in 1936, and in 1938 joined the Reiter-SA. Though he volunteered for the German army in 1939, he was not enlisted until 1941, after his school-leaving exams. Taken prisoner by the Soviet army in 1945, a year later Fühmann was sent to the central Antifa school (“antifascist” school for reeducating German POWs) in Noginsk near Moscow, where he began an intensive study of Marxism. Over the course of the next four years he attended similar schools in Ryazan and Ogre. In 1949 Franz Fühmann chose to move to the territory of the German Democratic Republic, where his mother and sister were already living. Until 1958 he worked as a functionary for the NDPD (one of the GDR’s nominally independent parties, designed to integrate exonerated former members of the NSDAP and the Wehrmacht). From 1958 onwards he worked as an independent writer and translator. He translated chiefly poetry and especially from the Czech and Hungarian; his own poetic production had ended with the collection Die Richtung der Märchen from 1962. His works from the 1950s, such as “Die Nelke Nikos” and “Die Fahrt nach Stalingrad. Poem” reflect the pathos of a socialism experienced as a fresh start. Throughout his life, Fühmann wrote for children and in dialogue with them, beginning with books such as Vom Moritz, der kein Schmutzkind mehr sein wollte (1959) and Die Suche nach dem wunderbunten Vögelchen (1960). Later works focus on confronting the past from the perspective of the younger generation that was caught up in the crimes of the Nazis, as in Das Judenauto (1962, English translation The Jew Car from 2013) and “König Ödipus” (1966). His work from the 1970s increasingly delves into myth and fantasy, dreams and wordplay, as in the book of wordplay Die dampfenden Hälse der Pferde im Turm von Babel (1978). Essays play a central role in Fühmann’s oeuvre, with seminal works of literary criticism such as “Das mythische Element in der Literatur” (1975) and “Fräulein Veronika Paulmann aus der Pirnaer Vorstadt oder Etwas über das Schauerliche bei E.T.A.Hoffmann” (1979). Yet the true turning point in Fühmann’s life is reflected by his Hungarian travel diary Zweiundzwanzig Tage oder Die Hälfte des Lebens (1973, English translation Twenty-Two Days or Half a Lifetime from 1992), which he himself termed his “entry into literature”. Retellings of classic myths and sagas for children and adults such as Das Nibelungenlied (1971) and Prometheus – Die Titanenschlacht (1974) take an important place in Fühmann’s oeuvre. The short story collection Saiäns-Fiktschen (1981) explores nightmarish dystopias. Fühmann’s penchant for controversy reached new heights in his encounter with the poetry of the Austrian Expressionist Georg Trakl: in Vor Feuerschlünden (published in West Germany as Sturz des Engels) Fühmann describes, with nearly manic intensity, his attempt to free himself from all ideological doctrines. 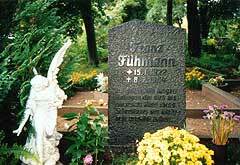 Due to his outspoken criticism of GDR cultural policy – fearless in his stance, yet remaining a firm believer in socialism as such – up to his death on July 8, 1984 Fühmann was a moral authority for a young generation of East German writers and a key supporter of non-conformist figures such as Uwe Kolbe and Wolfgang Hilbig.